GogoPipes each product has its own qualities. This sky glass bubbler has a really good bowl not too big and not small either. The length is around 6 inch and 2 inch base with stunning design. Pros: i can't contact you guys with email because i forgot my password but when will this item be back in stock? i really want to get it while the sale is still happening. Pros: Great piece hits good sits up straight without worry of tipping over. Comments: This is a great bubbler. It hits nice and smooth, and you don't realize how much smoke you just inhaled until you exhale for the first time. If I ever want another piece, I will definitely buy from this website again. Pros: I absolutely love this bubbler! Great size, fits nicely in the hand while hitting. Excellent rips. My favorite piece currently. Cons: the only problem i see is the down stem is way to short it dose not reach any were close to the bottom of the pot so you really have to fill it up but no worry's . you wont get water in your mouth with this baby girl. Comments: would i buy this again well im 50/50 on that the downstem is kida short. 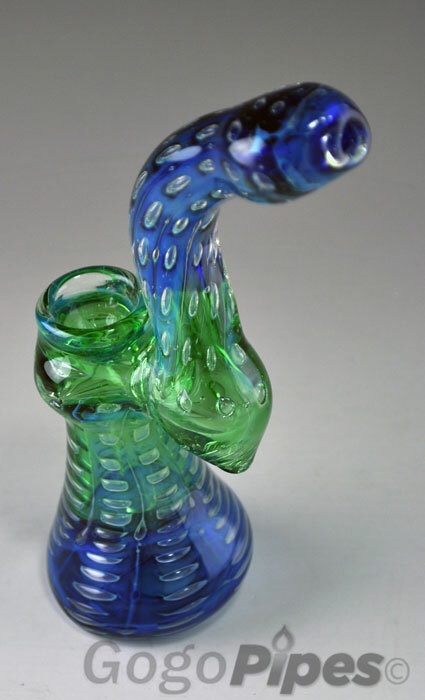 Pros: This little bubbler packs a HUGE punch! Almost only one bowl knocks me out. The bowl is the perfect size. Neither too small nor too big. The glass is thick and heavy. Just don't drop it too hard and you'll be fine. The water fills nicely and the stem is inside enough to create a smooth hit. If you are looking for a high quality glass piece, then look no further! I recommend this to anyone looking for a piece that is small like a pipe, but can hold water! Comments: This thing is amazing. Would definitely buy another IF this one broke. Pros: this little bubler is pretty thik and durable, i've knocked it over 4 times without breaking it . It also hits verry smooth. Pros: Nice little bubbler, draws smooth and cleans up easy with 420 cleaner.